Len Paget GM0ONX, RSGB Director; Colin GM4HWO, Andy MM0FMF, Mike GM4IGS, Pete GM4BYF, Danny GM6CMQ, Brian GM8BJF, Norrie GM1CNH, Peter GM4DTH. (Photo by Dave GM6KGZ - tnx). 1. 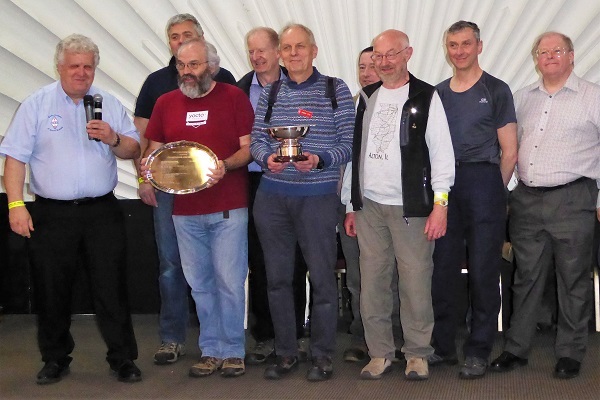 Martlesham Trophy for winner of the Restricted Section of VHF-NFD. 2. Cockenzie Quaich for leading Scottish station in the Restricted Section of VHF-NFD. 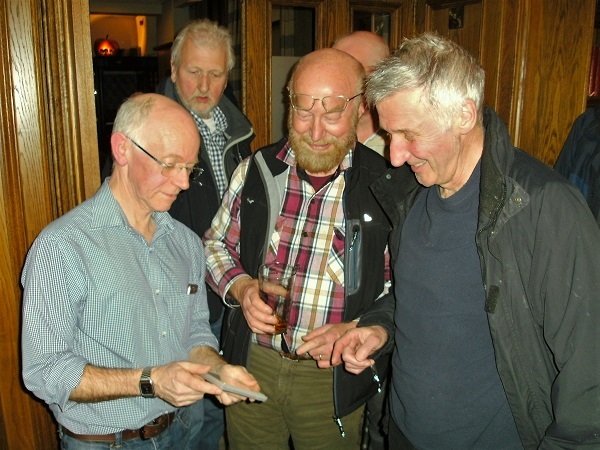 The presentation was made by RSGB Director Len Paget GM0ONX, a former Regional Manager for Scotland and the group photo above was published in RSGB RadCom, June 2017, p.7. See also: Trophies and VHF-NFD Report. NOTE: this group photo was published in RSGB RadCom, June 2017, p.7. Jim Forbes of Leonardo talked about the manufacture of equipment for RADAR at the LRS meeting on 22nd March 2017. He writes: "Leonardo is a multinational defence company specialising mainly in military products. The Edinburgh division, which traces its roots back to Ferranti in 1942, specialises in Radar systems and in Lasers. For the past 25 years or so I’ve worked on the manufacture of complex microwave modules for a large number of the company’s products. 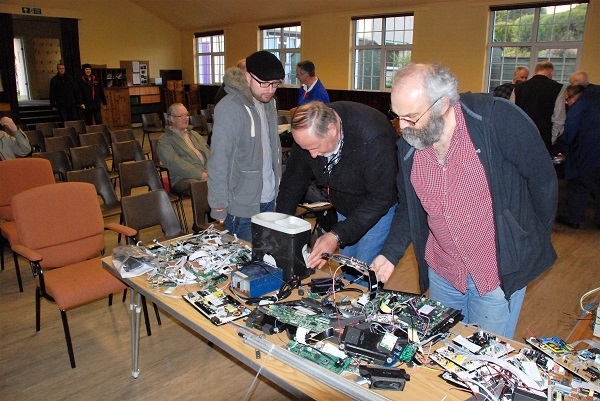 The LRS Spring Surplus Equipment Sale was held on Wednesday 5th April at St Fillan's Church, Buckstone Drive. There was a good turn-out including members of other clubs from as far away as Glasgow. The sale included a large number of small items from GM0FAL-SK which were sold by Andre GM3VLB and XYL Veronica. Many thanks to them both for all the preparation work they had done over many months. 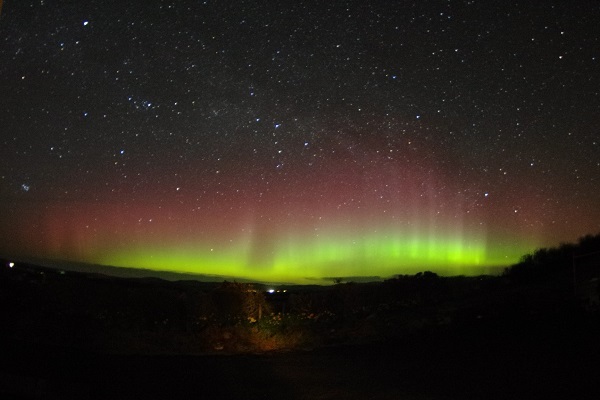 Many thanks to former LRS member Mike Senior GM3PAK, who lives with his XYL Marion GM1DCB on the isle of Islay, for this nice photo of the Aurora on 21 March 2017. Did anyone work anything via AU? Another aurora is forecast for the following evening but it will probably not be visual in Edinburgh due to forecast cloud and rain. 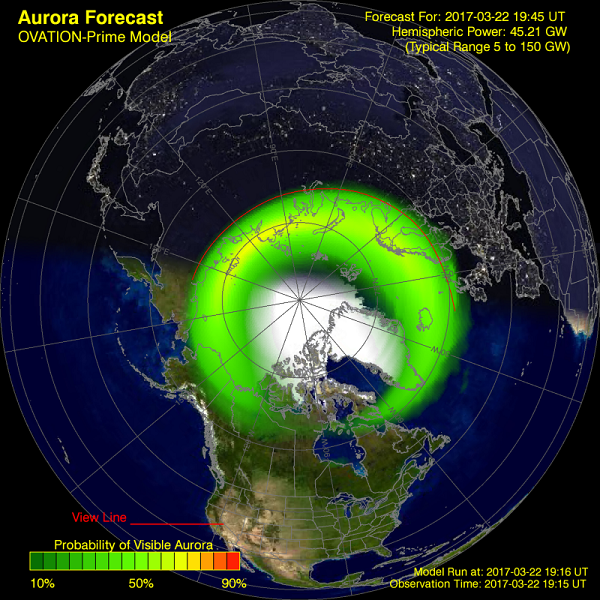 Forecast Auroral oval: Wed 22 March 2017. 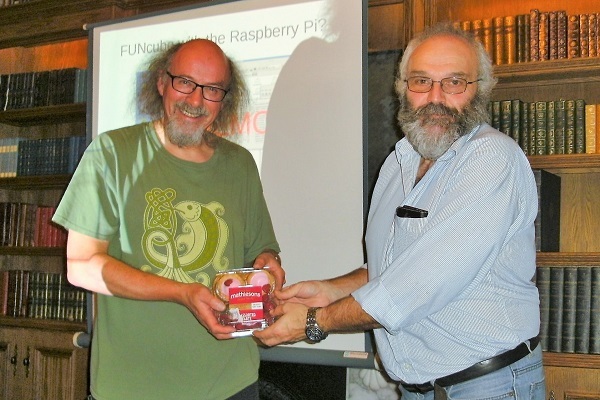 Following John Cooke's talk on amateur radio applications for the Raspberry Pi microcomputer at the March 8th meeting (see report below), John now reports that he has successfully received the FUNcube-1 satellite using a Raspberry Pi 3. He writes: 'Just managed the next stage of my satellite project successfully. 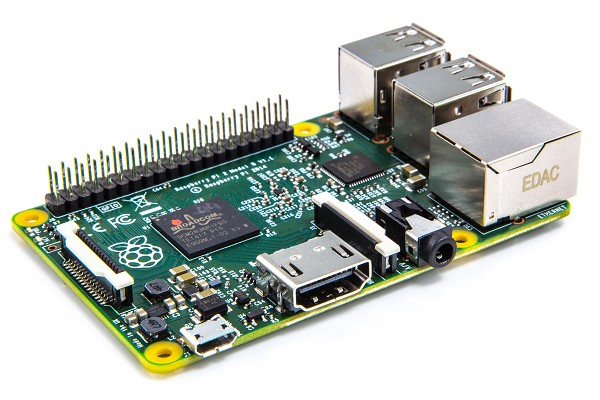 It uses the DVB-T dongle I showed at the talk, and the Raspberry Pi 3 (at present). 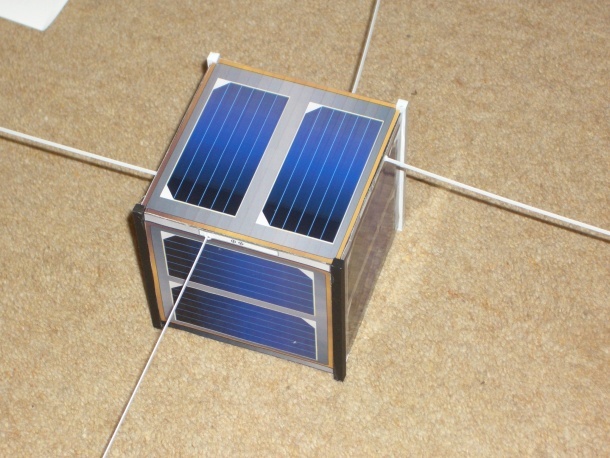 I'm really impressed that the satellite is so easy to receive with the dongle- I'm using a turnstile antenna for 145.9MHz outdoors'. 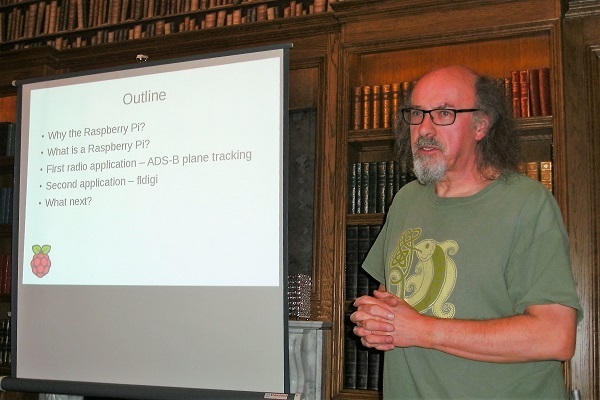 At the meeting of the LRS on 8th March 2017, John Cooke GM8OTI talked about the Raspberry Pi computer's history and variants, and gave a couple of simple examples with demonstrations of its use in radio applications. Full report. 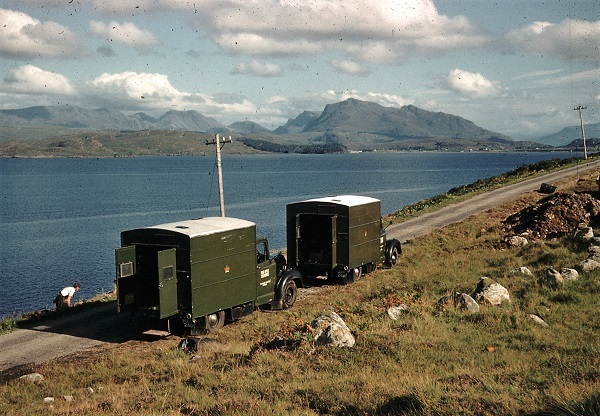 At the meeting on 22nd February 2017 John Macdonald GM4XZN described his career - "1948-1968, 20 Years with the Post Office Engineering Dept in the Highlands" - with many photographs and amusing anecdotes. This talk was an update on the one that John gave on 10th November 2010 (click to link). 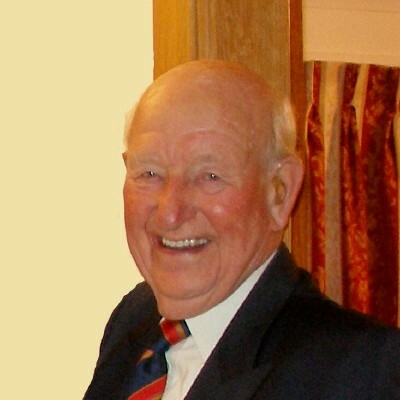 Bob McFarlane, one of the last surviving members of the S.O.E. - Special Operations Executive - in WWII, died at home in Kelso on 30th January 2017 aged 93. 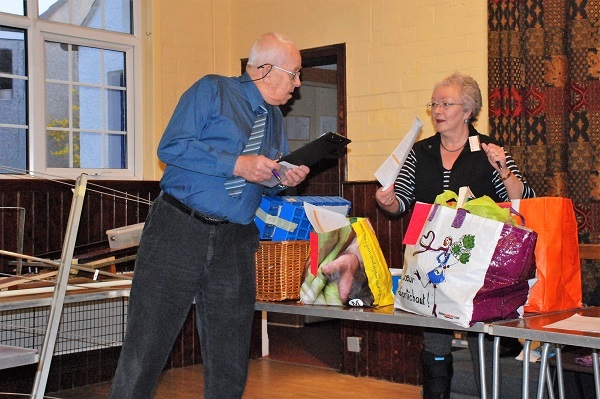 Bob had given two talks in recent years about his experiences - to the LRS on 24 February 2014 and at the MoC on 24 September 2014. (Click for reports). 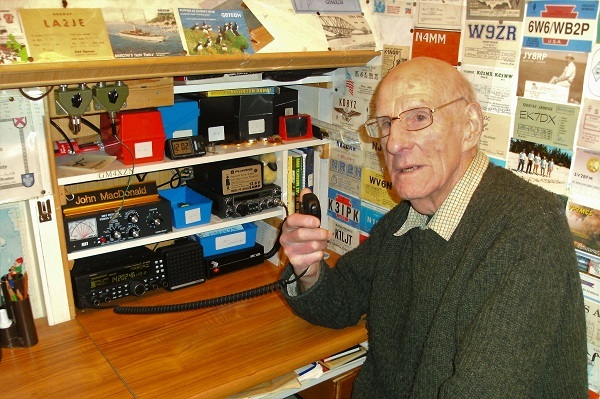 'As many MoC members know, Bob was never a ham himself, but as a radio operator behind enemy lines with Churchill’s Special Operations Executive in WWII, he got to know the famous B2 ‘spy set’ intimately, using relatively high-speed, coded CW, beginning as a 19-year old when he parachuted, at night, into the then Yugoslavia where he remained, with the partisans, till the end of the war in Europe. Following further jungle training in what was then Ceylon, he then had to dodge the Japanese in the Malayan jungle, before being sent to Hiroshima, just after the A-bomb. Those who attended his joint LRS/MoC talk in Sept 2014, will remember him as a modest, still military-like gentleman and indeed gentle man'. Bob's funeral at Melrose Crematorium on 14th February was attended by several LRS members. Click for Full SK. Click for Scotsman VIP Obit.